Just one year ago Matrox introduced their Marvel G200, a true all-in-one card that gave new meaning to the term "home video editing." The success of the Marvel G200 on the international market was pretty good, with an extremely strong following in Europe and a somewhat weaker sales report in the US. Overall, Matrox was pleased with the way things went with the product and it would make perfect sense for them to improve on it. 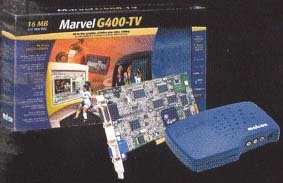 Rather than releasing generation after generation of the same Marvel G200 product, Matrox sat quietly away in their Canadian based offices and worked towards designing an even better solution (since the Marvel G200 did have its flaws) in order to live up to the success of the original Marvel. The May 20th release of the successor to the G200, the G400, made quite a few gamers smile but very little attention was paid to the potential this single chip provided for an upcoming Marvel product. In short, what would you get if you coupled the strengths of the original Marvel G200 with the functionality and performance of the semi-newly released G400 graphics chip? The Marvel G400. As we predicted back in May, Matrox will be making the release of such a product towards the end of the year and , as we all know, the holiday season is almost upon us and there will be quite a few users out there with around $300 to kill on something. Should it be the Marvel G400? When we first looked at the Marvel G400 on paper it seemed like there was very little you could do to make the Marvel G400 any different from the original Marvel. Adding the G400 to it just seemed like an attempt to improve the gaming performance of the card. A glaring oversight made in that assumption is the fact that in addition to improved gaming performance, the G400 offers support for the DualHead technology where a single graphics card can drive two separate video output devices. Still confused about how this helps the Marvel design? Imagine being able to preview one video source in a window on your monitor, while previewing another video source on your TV. Or imagine how helpful it would be to have your audio editing applications open in one monitor and have your video editing tools open on your TV at the same time. And if you're not spending all of your time editing home videos, how about the ability to work on a document, surf the web, or write emails while the rest of your family watches a DVD run off of your computer on the nearby TV without obstructing the windows on your monitor screen. These are three of the possibilities that the G400's DualHead feature brought to the new Marvel G400, but what else makes the Marvel G400 any different from the original release back in 1998?